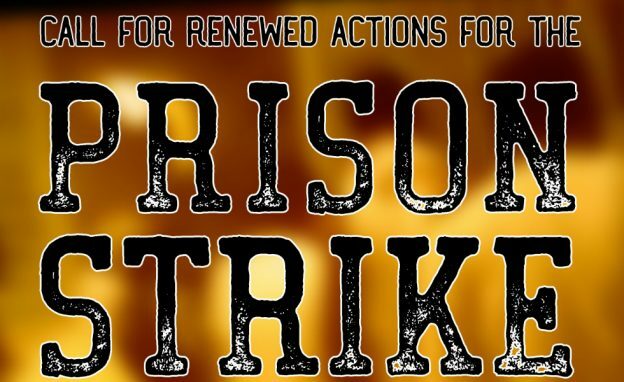 This entry was posted in General and tagged action, retaliation, solidarity on June 12, 2018 by Prisoner Support. KINCHELOE, MI – More than two weeks after prisoners at Kinross Correctional Facility participated in a nationwide prison workers’ strike, the prisoners’ own accounts of what happened are beginning to emerge. Prisoners report that the facility was on lockdown from September 10 to the morning of September 22, preventing communication with their outside supporters. This entry was posted in General and tagged action, michigan, midwest, retaliation on October 9, 2016 by Prisoner Support. It hardly seems necessary to summarize what has gone down inside U.S. prisons since September 9th. Hunger strikes, work stoppages, and riots have spread throughout the country on a scale that we likely aren’t even fully aware of yet. Some uprisings appeared took us by surprise, such as in several Florida prisons, while others presumably grew from recent organizing endeavors on the inside, such as at Kinross in Michigan or Holman in Alabama. By rough estimates, over 20,000 prisoners were involved in some way. That’s huge. On the outside, solidarity burned so brightly all over the world. Banner drops, graffiti slogans, noise demonstrations and more showed that we had the backs of all who would partake in the strike. It is worth noting however that the vast majority of this took place the first weekend of the strike. But this prison strike—and the struggle against prisons more broadly—is about more than a day or a week. It didn’t start on September 9th and it isn’t ending any time soon. Some prisoners may return to work while others decide to stop working for the first time. It’s easier when there is a definitive date to take action on, to build momentum towards, but that’s not going to be enough. This entry was posted in General and tagged action, attica, call to action, september 9, solidarity on September 29, 2016 by Prisoner Support. This entry was posted in General and tagged action, alabama, free alabama movement, holman, september 9, Southeast, strike on September 9, 2016 by Prisoner Support. 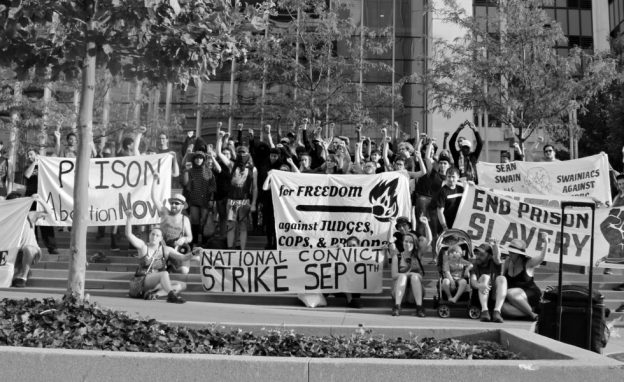 From August 26th to 28th, over 60 radicals from the Midwest, and from as far as Florida and New York, gathered in Columbus, Ohio for Bend the Bars, a convergence to build outside support and action for the nationwide prisoner strike this September 9th. You can see the prisoners’ call to action here. This entry was posted in General and tagged action, bend the bars, ftp, midwest, ohio, prisoner support, september 9, solidarity on September 2, 2016 by Prisoner Support. One of the most important things outside supporters can do is respond to retaliation against prisoners. We need to shine a protecting light on their struggles, let prison staff know people are paying attention. There are many ways to stand up, show solidarity, control the narrative, and pressure the authorities to cease their reprisals. We want to focus on and recruit people for one of the simplest ones: phone zaps. By contacting those authorities, swamping the email inboxes and phone lines with hundreds of calls, we stay their hand, sap their resources, and slow down their processes. We need you to volunteer now! We are looking for people to commit to maintaining this pressure on an ongoing basis, and folks at IWOC have made it easy for you. If you would be willing to make calls every other day then please visit and bookmark this site: (https://goo.gl/forms/s4gBzsgvz6W9LQoN2) make the calls, and fill in the one-line form at the bottom so we can send friendly reminders if you don’t. This entry was posted in General and tagged action, call in, incarcerated workers organizing committee, phone zap, support on August 30, 2016 by Prisoner Support. March Against Prison Slavery, an ad hoc action in Durham, NC in support of prison strikers. On September 9th, the 45th anniversary of the Attica Uprising, prisoners all across the country, from Alabama to California, from Texas to Ohio, from North Carolina to Washington, will go on strike. Called for and self-organized by prisoners as a struggle “to end prison slavery,” this may be the largest coordinated prison protest in American history. Those on the outside have been working for months to spread the word and deepen networks of solidarity and support. Above all, prisons are designed to isolate; the degree to which prisoners avoid violent reprisals and repression is directly related to how widespread and forceful our actions are on the outside. 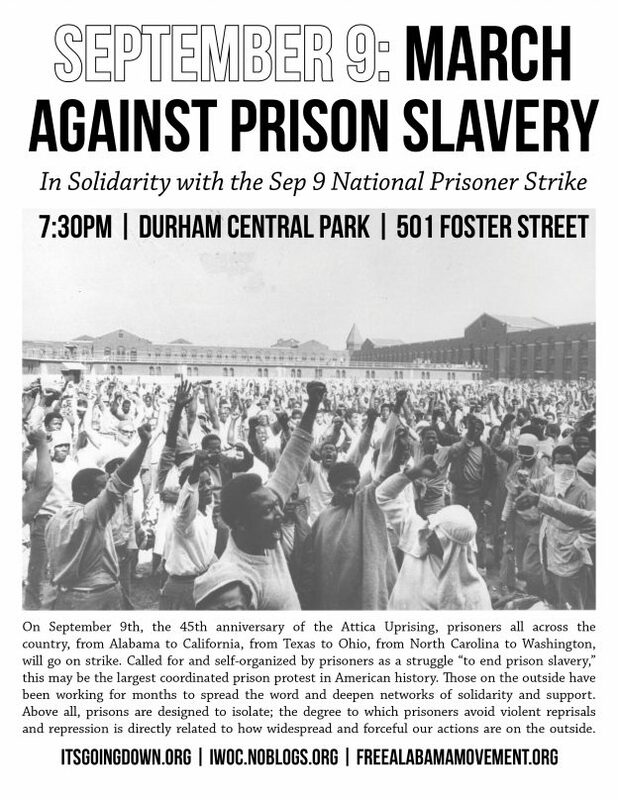 This entry was posted in General and tagged action, durham, North carolina, prison strike, prisoner support, september 9, Southeast, strike on August 23, 2016 by Prisoner Support. 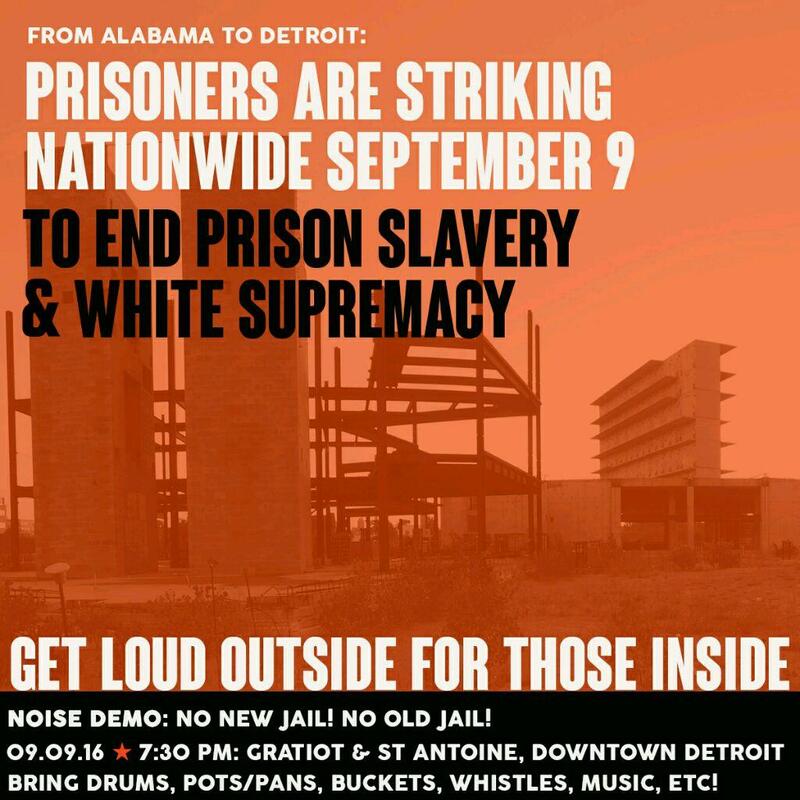 This entry was posted in General and tagged action, detroit, michigan, midwest, national strike, prisoner support, september 9, solidarity on August 23, 2016 by Prisoner Support. 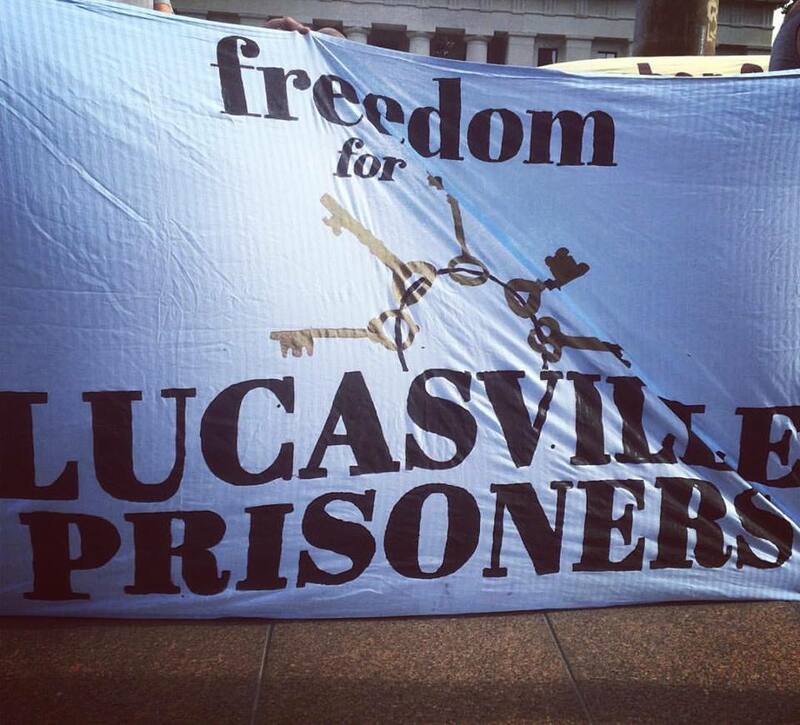 Inmates in Indiana’s jails have been tearing it up this month, with two rebellions in a week. The first riot occurred on August 1st in Vanderburgh County Jail in Evansville where, according to the mainstream media, inmates refused to be handcuffed, flooded their jail cell, put soap on the floor to trip the guards when they entered and used bed bunks and mattresses as barricades and shields. 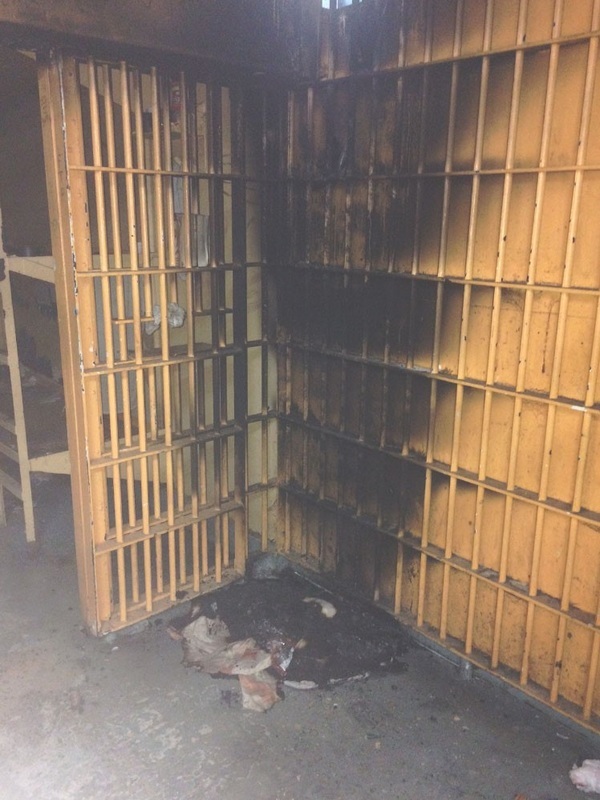 The second occurred in Henry County Jail on August 3rd and 4th where inmates set fire to mattresses and jail uniforms on two subsequent nights. The first fire was set by male inmates and the second, the next night, by female inmates. According to their captors, prisoners were attempting to deactivate the locks on their jail cell. As usual, the mainstream media made no effort whatsoever to interview the inmates involved in the disturbances or to capture the potential reasons behind their rebellion. For now, we are unfortunately left wondering what may have caused these individuals to choose to fight back against their captors instead of keeping their heads down. This entry was posted in General and tagged action, indiana, jail, legal, midwest, prisoner support, rebellion on August 18, 2016 by Prisoner Support. The Incarcerated Workers Organizing Committee of the Industrial Workers of the World has been working with prisoners and groups from across the United States organizing a Nationally Coordinated Prisoner Workstoppage for September 9, 2016. In anticipation of state reprisals against our members on the inside and outside, the IWW General Defense Committee is expanding it bail fund to assist those fighting to end prisoner slavery. Please donate and share this page!!! 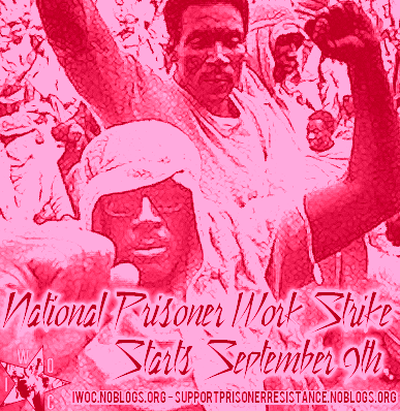 IWOC National Prison Strike September 2016 event page. Announcement of Nationally Coordinated Prisoner Workstoppage for Sept 9, 2016.
again, donate to the bail fund here. This entry was posted in General and tagged action, gdc, IWOC, IWW, national, prisoner support, september 9, solidarity on August 18, 2016 by Prisoner Support.